The village of Tirol (German: Tirol or Königsgnad) was intended as a Hungarian settlement. Those however refused to move there since they thought the quality of drinking water and the transport connections to be insufficient. After the farmers of Tirol (Austria) had lost their fight against Napoleon’s and his allied Bavarian troops, the insurgents were banned from Tirol. After a court decree on April 6th 1810, they were banned to the mountains of Banat where they were supplied with ground and construction material. Furthermore, they were granted three years of tax freedom. Thus, the first two dozens of Tirol families came to Banat in the early summer of 1810 to build their “new Tirol”. However, they were not happy with their allocated area. “A more mountainous area would be better” was their objection. Thus, they first lived in Fizes with other colonists and then agreed to move to the area that had been reserved for the Hungarian settlers. They sent a programme with 16 demands to the treasury in Timişoara and claimed that “the Christian Tiroleans (...) would not stay” without them being met. For example they wanted “only those Tiroleans who have distinguished themselves in the war (1809)to be allowed to settle” there. As soon as 1813, a wave of re-migration began. 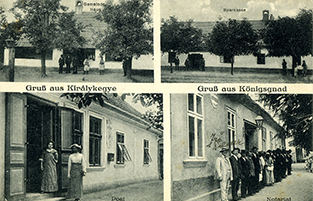 Part of the banished Tiroleans went back to Austria and others founded the “Tirol Alley” in Timişoara (today “St. Ciprian Porumbescu”). Only few “Imperial houses” can be found in Tirol. Some of these first settlers’ houses were built after a specific pattern even before they arrived: three windows facing the alley, an open corridor and a porch held by columns (“colonnade”) towards the yard. Often, this was used as a sleeping ground in summer. The houses had a large kitchen with an open fireplace, a big air vent which was used as a smoking and storing meat. Around the fireplace, bedding was prepared. The stables could be found in the back, facing the garden. Karl Tribus was the Tirol’s charismatic pastor for almost two generations. In the village that was inhabited by Germans, Croatians and Romanians after World War II, Tribus was the pastoral companion of the Germans and Croatians. After his death, nuns from Wernberg in Carinthia came into the parish and took up his work. They also did social work and furthered the cultural development of the village. To everyone’s great regret, the sisters had to retreat to their motherhouse in early 2013. 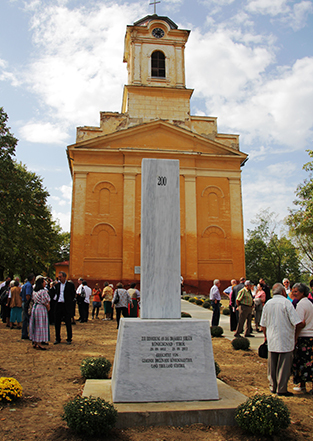 The Roman-Catholic church was constructed in 1850 and played a large role in the festivities of the 200th anniversary of settlement in 2011 and 2012. Life in the village at the turn of the century.